Dr. Davis had been a chiropractic patient for his entire life due to his mom’s incredible life-saving experience with chiropractic during her childhood. She had terrible asthma that no medical doctors could help her with. Chiropractic allowed her to get better, and Dr. Davis has always enjoyed the many health benefits offered by chiropractic care. Combined with his love of helping others, becoming a chiropractor was a natural choice. 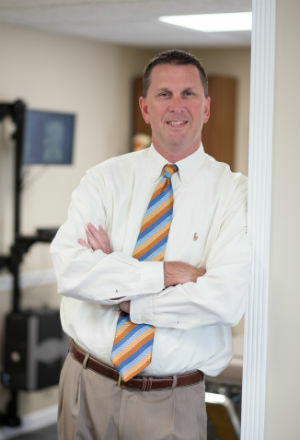 Dr. Davis attended Life University in Marietta, Georgia, earning his Doctor of Chiropractic and Bachelor of Science in Nutrition. He’s been in practice for more than two decades and is a member of the Georgia Chiropractic Association. He’s also an examiner for the National Board of Chiropractic Examiners. Married to Shelly for over 25 years, Dr. Davis and his wife stay busy with their family. They have four sons. Parker and Palmer attend Trinity Christian School and their oldest two sons are currently in college. Pierce is attending Kennesaw State University, in Kennesaw, Georgia; Preston, is attending Life University in Marietta, Georgia, following in his father’s footsteps and studying to become a chiropractor. In his spare time, Dr. Davis enjoys being outdoors fishing, boating, camping and going to NASCAR races. Dr. Davis is an in-network provider with many insurance plans and files with Medicare. Schedule your appointment today!